Marc Jacobs is the first of two designers I’ll review who’s collections as private labels far exceeded their lines under large fashion house names this season. DON’T get me wrong, Louis Vuitton was beautiful, but there is nothing like a “Marc Jacobs” fashion show to make you weep into your yogurt sitting on your bed at 11 am on a Sunday. 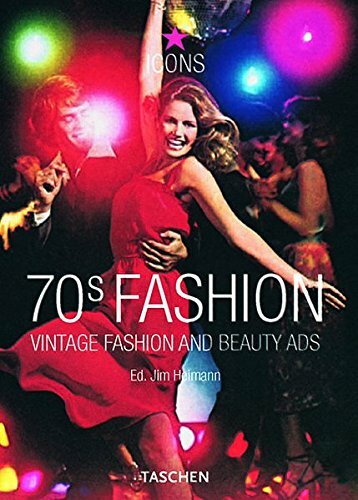 I decided to post about this particular collection because I’ve just been dying to dissect it and also because I get to talk about the influence fashion in the 1970s has had on fashion in the modern world. Dig? Anyone who takes one look at this collection can see that the clothing could be part of Farrah Fawcett’s wardrobe circa 1977. The first thing that gives it away is that long slender 70s shape that all of the pieces accentuate. The dresses feature straight cuts and very bold patterns all in a wash of beautiful bright flowing colour. The dark purples and thick oranges glide down the runway – these are the clothes that models were meant to wear. The long thin, straight look on heels that stilt walkers would find challenging. What I love about the idea of having a practically unlimited budget for a fashion show is that the designer can do whatever they’d like to do to convey the message they wish to convey. The Marc Jacobs show took place in a large, smooth wooden set, reminiscent of a ships’ hull. It reminded me very much of the Art Gallery of Ontario in Toronto designed by Frank Gehry. The rich colour of the wood complimented the palette Jacobs chose to work with perfectly. Not to mention that the feeling that wood gives me is one of warmth, thinking of my mom’s style of decoration. She was totally rad in the late 1970s and would have been all over this collection. The thing about the 70s is that prior to that time there had always been great fashion movements like Coco Chanel – 1910s-1930s, Christian Dior – 1940s-1950s, and the introduction of the Twiggy, mini-skirt, hippie, jive looks of the 1960s that all came before the era of disco, Nixon and Women’s Liberation. The 1970s saw the creation of the celebrity, fashion life style that we know in the industry today. After the earthy, “natural” vibe of the 1960s, people were ready to dress up again. Discos like Studio 54 gave people a place to wear upscale designer clothing and the trend proved to be one of considerable longevity. WOW I totally didn’t even talk about what a genius Marc Jacobs is for bringing back the glamour and silhouette of the 1970 without all of the tacky detail and flash we’ve come to know and abhor about fashion in the decade. Jacobs is the Creative head of three major labels currently, his own self titled line we are discussing here, an offshoot line titled “Marc” by Marc Jacobs and of course the legendary French luggage company turned glamorous fashion house: Louis Vuitton. Jacobs is one of those designers who’s just been doing it since he was born and will never not be making beautiful, unique clothing. I think this is a very exciting and impressive time in the history of the fashion industry and we’re all very lucky to be a part of it. Fashion designers like Marc Jacobs or many of the others I’ve discussed or will discuss soon now live like celebrities and make as much of a contribution to the world of art and beauty as any other medium available in this high technology world we live in. No matter how high tech our world gets, people will always have a need for clothing and women will always desire to look beautiful.